Was it really supposed to end like this for the St. Louis Blues? When the buzzer sounded on Game 3 of the Western Conference semi-finals between the Blues and L.A. Kings, it was supposed to be the Blues who were up in the series. Sure, they dropped Game 1 by a 3-1 score, but all experts pointed to the Blues to rebound, to crown the Kings, to at least be ahead in the series 2-1. They were supposed to learn from the Game 1 setback. Instead, the Kings are standing over the Blues, looking down at them from a 3-0 series lead in a best of seven tilt that was pretty much over before it started. The Blues have been outplayed in almost every game, every aspect. 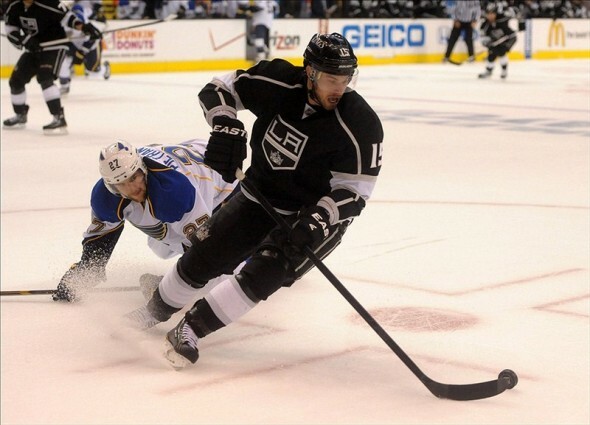 The Kings have played the St. Louis Blues’ style of hockey, and St. Louis has not found an answer. Before one jumps all over the Blues, let’s not forget how well the Kings are playing. The Kings have been in a dogfight for a playoff spot two months before the playoffs even began. They dispatched the President’s Trophy winning Vancouver Canucks in five games. They have been in do-or-die mode for most of the second half of the regular season. They know the risks of taking even one shift off, and coach Darryl Sutter has them playing playoff-style hockey. Sutter, as one may recall, led the Calgary Flames to the finals in 2004 and came within a whisker of winning it all back then. Sutter knows the ups and downs of playoff hockey better than most. His team is prepared. As for the Blues, the one thing that was supposed to be their strength has turned into their biggest weakness. Brian Elliott has not looked good between the pipes for St. Louis. After splitting the duties with Jaroslav Halak, Elliott finds himself the undisputed starter after an injury felled Halak. He has not looked comfortable, and he has not duplicated his stellar numbers from the regular season. Part of the Blues’ keys to success revolved around their goaltending, and now, when needed most, it has not been there. Elliott has been outplayed by Kings’ goalie Jonathan Quick. However, to plant the blame solely on Elliott would be looking for an easy way out. The entire Blues’ team needs to step up. They have one game to get back on track…and there can be no mistakes. The Blues’ season isn’t over yet…but only three teams in NHL history have rallied from a 3-0 series deficit to win. To join the ranks of the Leafs (1942), Islanders (1975), and Flyers (2010), the Blues have to find a way to solve Quick while keeping the puck out of their own end. While the eternal optimists are right, that the series isn’t over until it’s over, there has been little evidence that the Blues have what it takes to spark this comeback. Any momentum they have gathered is quickly snuffed out by the heroics of Quick in the Kings’ goal. Can the Blues pull it off? Could a sparkling regular season really come to a premature end? All these answers will be provided come Sunday, when they take to the ice for the Game 4 contest. There is no room on the Blues’ train for any passengers.